Friday Night Fights: Boogaloo - Round 2: Quantum Physical! 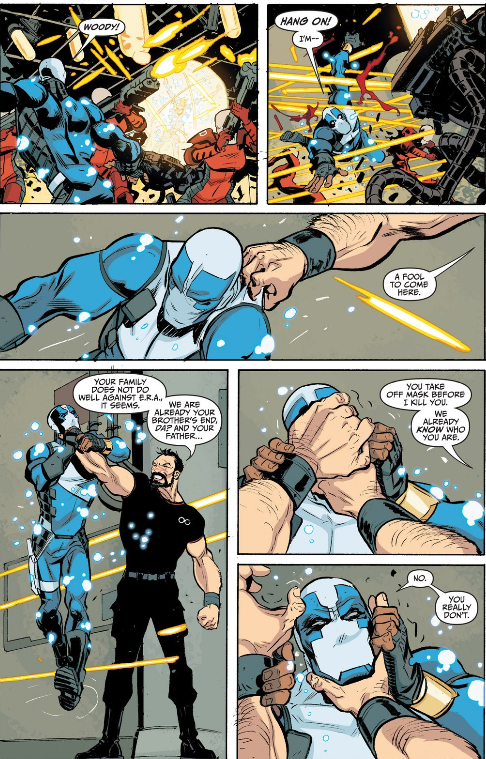 I've been picking up a lot more of the new Valiant Comics titles in this past year or so, and tonight's Friday Night Fights: Boogaloo is a perfect example of why. 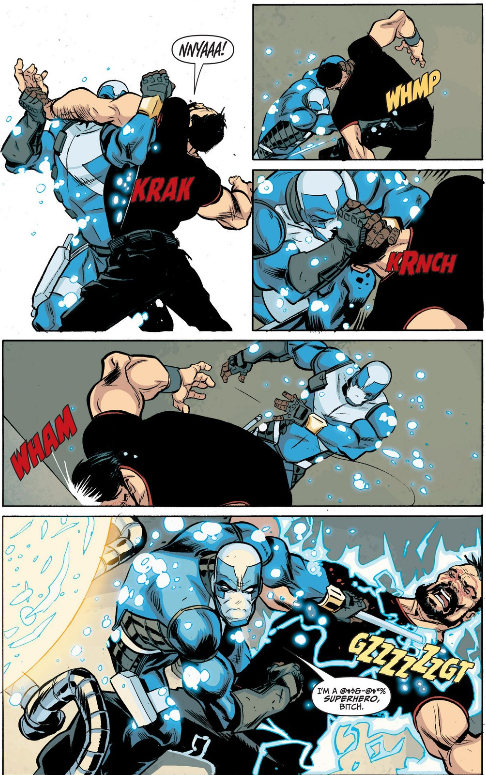 It comes from Quantum & Woody#4, written by James Asmus and illustrated by Tom Fowler. Synopsis: Eric Handerson aka Quantum is attempting to rescue his foster brother Woody, who has been kidnapped by the mysterious group known as Edison's Radical Aquisitions aka ERA. Let's see how well that goes for him. Tonight's fight music is this musical question posed by Kathryn Calder. For more Quantum-powered quashings,click here. And don't forget to vote! Friday Night Fights: Boogaloo - Round 1: Eat Your Heart Out, Pete Townsend! Greetings! 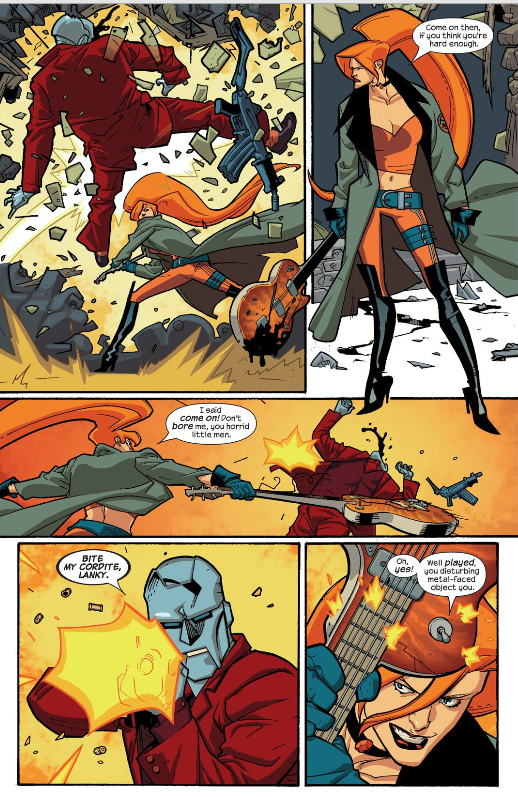 Our host Spacebooger's latest Friday Night Fights bout is called Boogaloo, and I'm going to start off rocking and rolling, courtesy of Nextwave: Agents Of H.A.T.E.#1 by Warren Ellis, Stuart Immomen, and Wade Von Grawbadger. 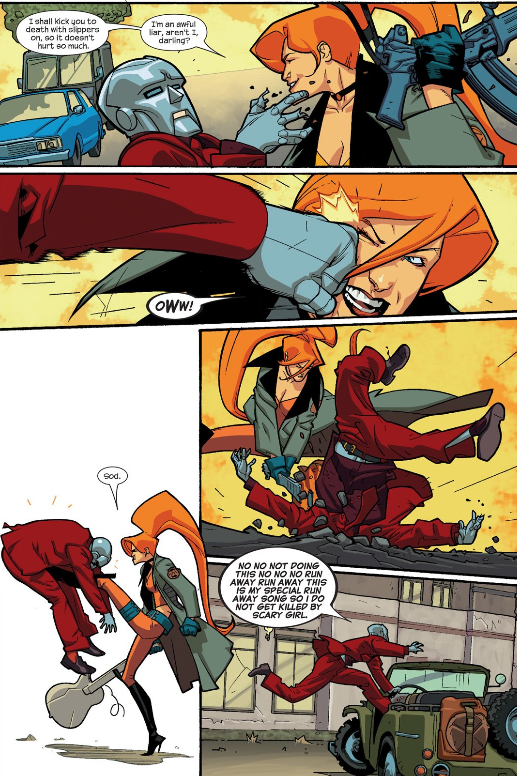 Synopsis: Elsa Bloodstone finds herself under attack by the Beyond Corp.'s own Human Resources department. But luckily, she has a weapon. Guitar vs. Gatling. Which one will win? Sorry, pal. You're about to have a little fender (Strat) bender. John Hiatt, the source of tonight's fight music, would not approve, Elsa. For more Townsend-style thrashing, click here. And don't forget to vote! Friday Night Fights: Red Devil - Prize Fight: Misadventures In Babysitting! Welcome to this week's special Friday Night Fights Prize Fight: Red Devil, in which our humble host has one special rule: Each entry must be a scene featuring a fight with a red devil. I'll do better than that, Spacebooger. How about....two red devils? 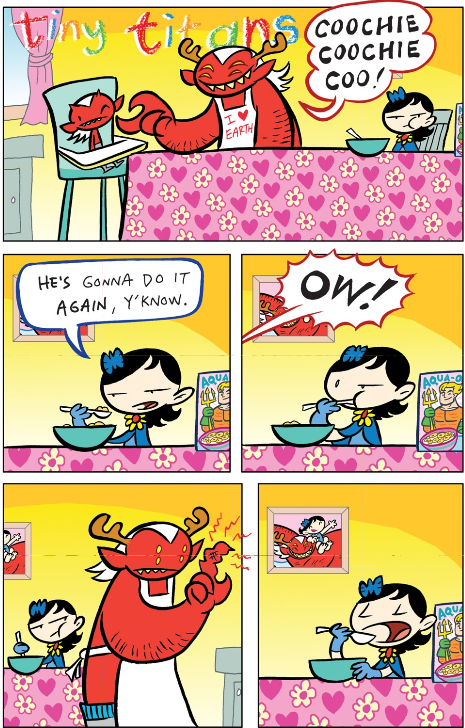 Tonight's devilish donnybrook comes from Tiny Titans#27 by Art Baltazar and Franco. Synopsis: Raven is tasked with watching Kid Devil for the weekend, so she takes him home to her house, where her dad Trigon insists on treating him like a baby, complete with high chair. Wow, Trigon's demonic digits must be feeling a world of hurt. Tonight's fight music is this rookie effort from Todd Rundgren. For more biting humor, click here. And don't forget to vote!